In 2019, we’re doing a whole season focused on how humans and nature have shaped each other in Edmonton. We kicked things off with a live show to brainstorm question ideas, and now we’re exploring the history of dams, bears, climate change, and more. Part of the process of creating this season was going through a big stack of books for inspiration, from authors like Carol Kaesuk Yoon and Alexander Wilson. To spread that intellectual joy and give listeners a peek behind the curtain, we’re doing a book club this season. Once a month, we’ll get together and talk about a book that’s helped inspire the podcast. You don’t have to read the book to join in! Just drop by and join us to chat. Amandah van Merlin poses with a copy of Living in the Shed. 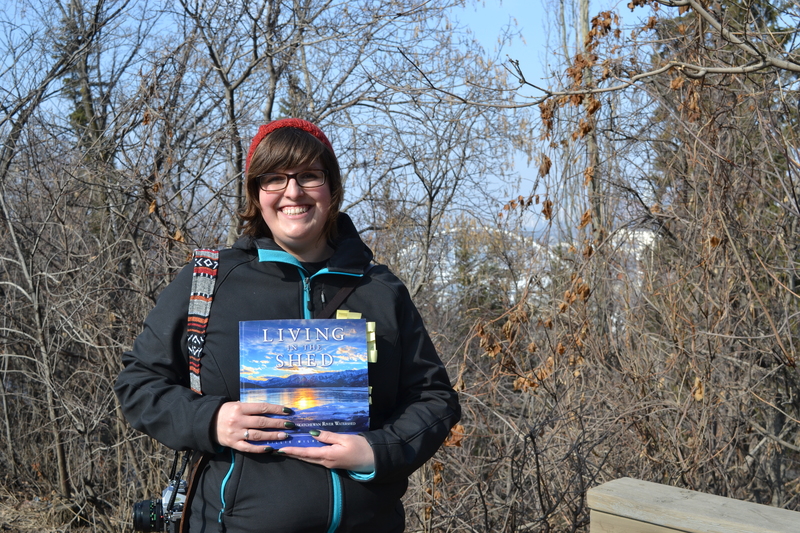 We’ll be reading Billie Milholland’s book Living in the Shed: Alberta’s North Saskatchewan River Watershed. It was featured in our recent episode, Dam Complicated. The book is a very visual guide to the history, ecology, and life of the river from the Rockies to the border with Saskatchewan.